The ideal recording would be one that sounds as if the band is right there in front you. We have one pair of ears, so why not take a stereo microphone, place it in front of the band and press record? Simple ...but somehow it does not work like that. At least we have not yet heard a one microphone recording of a whole band, that we found completely satisfying. We are big fans of Josephson microphones. They are the secret to our critically acclaimed double bass sound. So we thought that if one mic would be able to do the impossible, it would be the Josephson C700S stereo microphone. 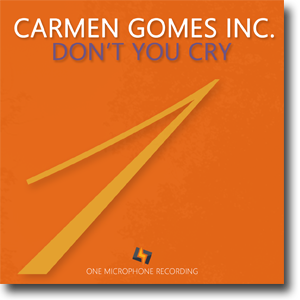 We had hoped to be able to try it out on a Carmen Gomes’ recording session, but there was an unforeseen problem with the delivery, the mic would not be on time. Having booked the studio and the musicians, we decided to go ahead and record the album the way we mostly do; a stereo pair and spot mic’s on the individual instruments. We had just recorded the last song of the session when the Josephson C700S arrived. The band had to go and play a gig in the evening and Frans had a lot on his mind that day, so nobody was really in the mood for testing a new microphone but Carmen said: Come on, lets just make a quick take of something simple; "Let’s play 'How Long'!". So we all gathered around the mic, made the take, packed up and rushed off to the gig of the evening. Next day Frans called me up and said; "I can’t stop listening". "Did you already make a premix of the session", I asked. "No, I am talking about the one take with the Josephson C700S; there is something very special about it, we need to really test that mic. Could you all come back next month?" The band has just spend 3 days recording an album and we were rather pleased with the result. So as not to waste any precious studio time, we grabbed a bunch of songs that have been in our live repertoire for years and went back in. Multi track recording has advantages and disadvantages. The good is that you can make an instrument louder or softer as you please. The bad thing when the recording is done in one room is phase. Maybe, the most time consuming aspect of our way of recording is getting the phase between the mics right. Frans de Rond is a true genius in that field and his expertise is one of the secrets to our well defined sound stage. Now with only one mic the challenge lay elsewhere. Mixing was no longer possible. We would have to make the complete sound stage right there by carefully moving each instrument closer or further away as well as left and right in relationship to the microphone. Carmen was given a headphone so she could hear exactly what the mic was hearing. She could then direct the musicians and with hand gestures let each band member play louder or softer. Special credits goes to drummer Bert Kamsteeg who, while playing a full modern drum kit, managed to drive and colour each tune with his unique style, but never over power the pure non amplified sound of Carmen’s voice and my upright bass. Guitarist Folker Tettero decided to play the whole session on his old archtop guitar. It is quite unique that you can actually hear the pure acoustic sound of the guitar blending in so well with the sound from his custom made amplifier. Listen to Folkers comping during the bass solo in 'Where can I Go'; that’s practically the pure sound of his guitar and not to forget; the sound of his hands. Almost all the songs are first takes. Except for 'Billie’s Blues' and 'How Long' where second takes where needed in order to get the balance right. Niels Henning Orsted Pedersen told me how Ben Webster was the only musician he knew that could play himself to tears while playing a ballad. I know one more; Carmen Gomes. It happened, on the Little Blue album and again on this recording as she was singing the last words to Gershwin’s beautiful ballad 'Summertime'. Carmen was very apologetic and wanted to make another take, but Frans refused to press the record button. "I’ve got goosebumps all over. And why is it a problem to shed a tear while singing; ……‘don’t you cry’... !?" Recording and mastering by Frans de Rond. Recorded at M.C.O, Studio 2, Hilversum, The Netherlands, on the 26th of October and the 15th of December 2018. Music arranged by Peter Bjørnild with lots of help from Carmen, Folker and Bert. 'Summertime' arranged by Cajan Witmer and Peter Bjørnild. All power cables and power conditioners by AudioQuest. Special thanks to Jules Fransen of Joystick Audio.